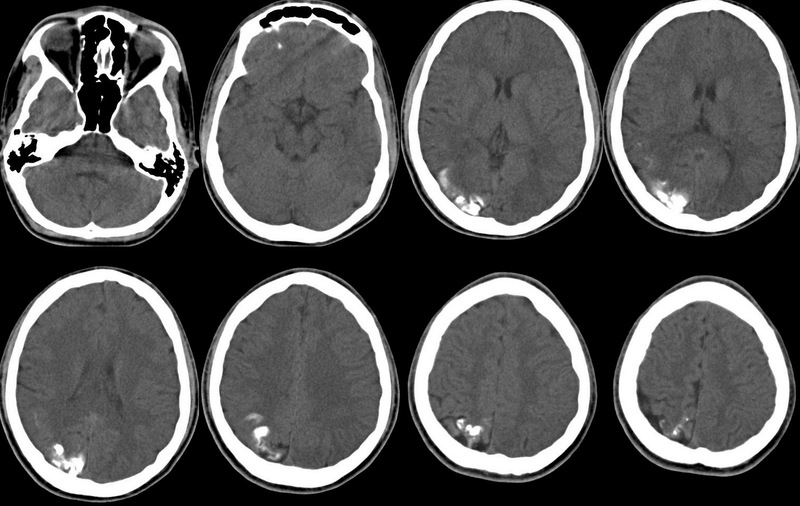 A 17 yo female came for CT Brain screening for seizures since last 5 years. Non contrast CT study of Brain shows dense right parieto occipital gyriform calcification with an associated focal cortical Gliosis. 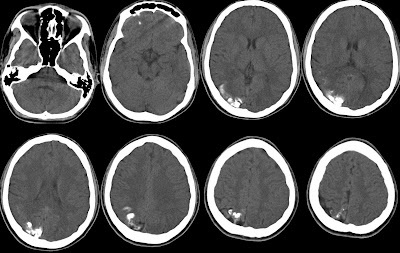 No other associated findings to support Sturge Weber Syndrome like ipsilateral hemiatrophy, compensatory thickening of ipsilateral hemicranium, Hyper pneumatisation of ipsilateral para nasal sinuses or mastoid, ipsilateral Choroid plexus enlargement. No ipsilateral port wine stain on face on clinical examination. -Ossifying meningoencephalopathy and Meningitis Ossificans. -Chemical meningitis secondary to subarachnoid fat from an Epidermoid tumor. -Sequel of intrathecal administration of methotrexate for Leukemia. -Skull irradiation for conditions like leukemia, lymphoma. -A consequence of cerebral folic acid deficiency in pt's with coeliac disease and epilepsy, the calcification appeared after treatment with anticonvulsants. Hypothesis is that the treatment contributing to the development of profound megaloblastic anemia and folic acid deficiency interfering with cerebral matabolism resulting in dystrohic calcification.